For today's post, I thought I would talk about my first impressions of a few products I've been trying lately. I had heard a few people talk about the L'oreal Infallible Pro-Matte Foundation, even though I have dry and dehydrated skin and the word "matte" in the name suggests it wouldn't be great for my skin, I picked it up. In terms of coverage, lasting power and finish, I love it. It looks amazing on the skin, makes it look flawless and covers everything, however in terms of the shade, it's not great. The shade Vanilla was the closest match to me however it is very very pink, although I do absolutely love the foundation, I may try mixing it with the lighter shade and attempt to make it match my skin tone because at £7.99, I think it's a fabulous foundation. When it comes to eyeshadow palettes, I tend to play it safe and stick to 100% neutral palettes, however when I spotted that one of my favourite brands, Anastasia Beverly Hills, had released a new palette; I needed it. The Shadow Couture World Traveller Palette includes more colour than I'm used to and my first impression to it was "I'm not sure." I've struggled to create looks that I find wearable and I feel like the neutral shades don't work too well together and I find the shadows more difficult to blend in comparison to Mac or Urban Decay shadows! Onto another product from Anastasia Beverly Hills, the Cream Contour Kit. I bought the shade "Light" as my skin is very fair, the product is a lot harder in consistency to what I was expecting and takes quite a lot of blending in to look natural however after it is blended, it looks great! It's something I would save for going out or a special occasion as it is quite time consuming! 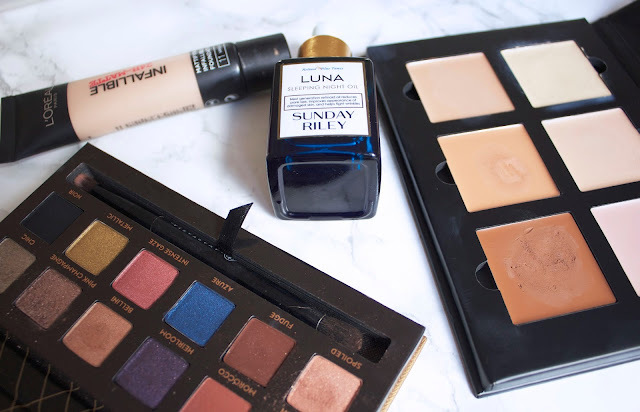 Finally the much discussed Sunday Riley Luna Sleeping Night Oil, every review I read on this was positive; saying it was amazing and they noticed a difference overnight. Therefore, I was expecting great things, did I notice a difference overnight? No. Was I amazed? No. I admit, my skin did seem more hydrated and foundation didn't cling to patches as much but I honestly didn't notice much of a difference in my skin. I'll keep using this and see if it works wonders over time and I'll get back to you.. I need to ABH palette, life necessity!